Contest: AltRiders GOTRAX Hoverfly ION LED Hoverboard $200 RV! AltRiders GOTRAX Hoverfly ION LED Hoverboard $200 RV! 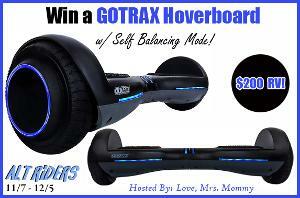 Prize: AltRiders GOTRAX Hoverfly ION LED Hoverboard $200 RV!